Back From the BIG City! Well, we did it! We left at about 8:00 this morning and although it was sunny, the roads were really icy in places. The temperature dropped about 25 degrees overnight and the wind was gusting so the flash freeze that was in the forecast did indeed happen. Rain, snow, ice, wind...did they manage to put a damper on my shopping? Absolutely not! I think the quilt shop knew I was coming because they had lots of new fabric on display and if you can believe it, almost everything had my name on it! Really! 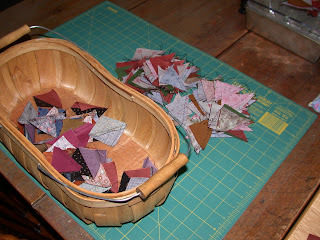 Nearest the door and first into my basket was a bundle of 10 fat quarters for a redwork quilt that's on my "to do" list. These didn't even have to call my name. They just jumped into my basket even before I had a chance to say hi to Michele the shop owner. 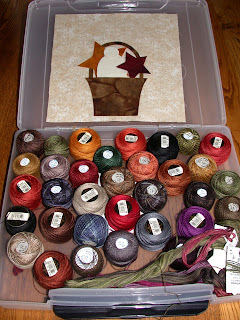 Next on my list was more Mettler embroidery thread to add to my ever-growing collection. This has become my thread of choice for applique. I believe there are about 55 colors and I think I now have about half of them. In order to avoid duplication, I take my list of numbered colors with me and add my new ones to it. 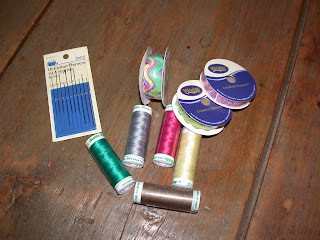 I also bought some ric rac and long needles for some pin cushion projects that are on that same "to do" list. 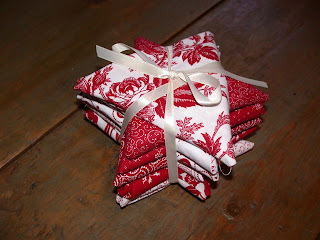 Then...my ultimate weakness...Civil War fabrics! These are only a very few of the new collection that just arrived and they were definitely calling out to me to take them home. How could I possibly refuse? Did I stop there? Absolutely not! This fabric was literally screaming at me and three yards later, my basket was getting kinda full. Can you imagine a border done with this fabric? I think I'm about to swoon. 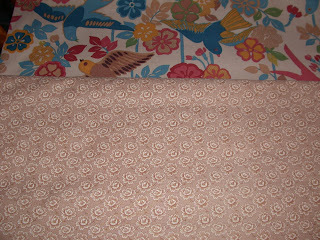 And last, but certainly not least...two yards of this wonderful taupe-y Civil War fabric from the same collection. We had a nice lunch on the way back and even managed to take the dogs for a walk. Shopping in the BIG city makes me happy but it sure tires me out. Happy stitching! I found the pattern for this purse as a freebie on the internet some time ago and printed it off to save for a rainy day. Well, guess what? It poured cats and dogs again all day today so what better to do than stay indoors and try something different. After initially cutting out the pattern this morning, it appeared that it was going to be too small so I made a few adjustments and enlarged it about 2" all around. Next, I went through my scrap bin and selected a bunch of fabrics that I liked, then cut and pieced them together to fit the altered pattern size. The original pattern called for plain yardage but I went for the scrappy look. I used a bunch of civil war fabrics which I love and it took about 4 hours from start to finish to complete. It probably would have taken less time but I sewed the binding on by hand because I didn't want the stitching to show. 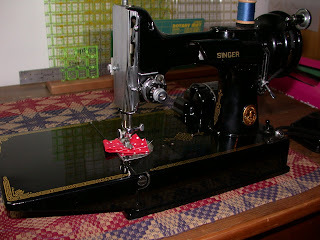 This was also the first time I tried machine quilting. It took a while to master the hand-eye coordination thing but having my tongue out the side of my mouth helped a lot and as a result, it didn't turn out too badly. I did a simple random stipple pattern and held my breath the whole time. We're supposed to have a flash freeze tonight after all this rain. My DH and I are planning to go to the BIG city tomorrow to do some shopping but it's all going to depend on the roads. I'm keeping my fingers crossed because the BIG city always includes a stop at the quilt shop. And if we go, I'll be able to use my new purse! I think my Mom should have named me "Vintage". Anything vintage attracts me like a bee to honey and I find it difficult to unstick myself. I've been thinking about needle and pin keeps a lot lately... the vintage kind. As a matter of fact, I had a difficult time sleeping the night before last, as ideas kept popping into my head. When I was designing in the decorative painting industry, I learned my lesson the hard way, i.e. no matter what time of the day or night, when an idea came into my head to get out my sketch book, do a quick line drawing and make a few notes. Too many times I said to myself that I'd remember it in the morning but alas, when morning came, I drew...literally...a blank. Tuesday I found myself in the kitchen at 2:10 a.m. not to snack, but to sketch and make notes of my blossoming needle and pin keep. I love working with wool and cotton and that's where my thoughts were heading. Yesterday morning, bright and early, I found myself in my sewing studio measuring, cutting, and stitching, and this is what I ended up with at about 7:30 last evening. My needle and pin keep! This is the outside front and the dimensions are 4" x 6". 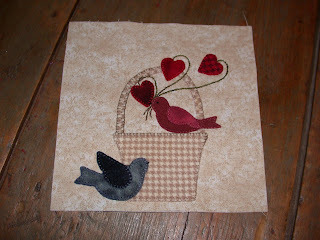 The birds were inspired by Ann Sutton's birds from the February block of her Tisket-A-Tasket BOM. When you open it up, you can see a piece of vintage-looking (that word again) fabric which I sewed to the background wool, then frayed the edges to make it look...what else? Vintage! Then there's a piece of wool that I stitched onto the left side for pins and added a little pocket to hold "necessities". The dimensions when open are 6" x 8". Then there's another wool insert that I stitched down the spine with another little pocket to hold more "needfuls". I ordered some vintage mother-of-pearl thread rings which will be sewn onto the black wool on the left to hold floss. Hopefully they'll arrive by Monday. And finally, the heart scissors holder. I love my little needle and pin keep and I know it'll get lots of use. Happy stitching! It's a beautiful sunny day here in Eastern Ontario so I'm going to pretend that I'm writing this from Hawaii, which is where I was yesterday...sort of. I did have a banana and fresh pineapple with yogurt for lunch, but there were no waving palm trees or azure seas, so my reveries didn't last too long. What I did do that fits the theme was complete the appliqueing of my Hawaiian quilt and that's the closest I'll probably ever get to Hawaii in this lifetime. One can dream, right? I took this class back in November from Janine Merrill who is a member of our guild. She is an expert in Hawaiian applique and I always admire her quilts when she brings them for "Show & Tell." One of her quilts won best in show at the Vermont Quilt Festival last year and I believe there is a picture of it in the last issue of the Quilter's Newsletter magazine. She hand quilts everything and her work is exquisite. Janine is not only a wonderful person but a great teacher as well and I learned so much from her. 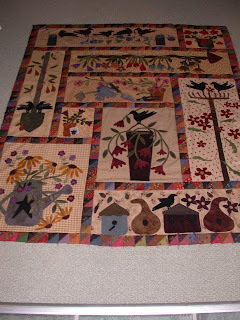 Hawaiian quilts do not really fit in with my style of decorating but I will definitely do more as I love to applique and the quilts make wonderful gifts. Appliqueing this top certainly honed my needleturn skills. 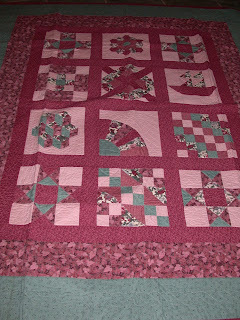 I'm going to hand quilt mine and it will probably hang in my sewing studio for a while when it's done. Yesterday was another snowy, blowy day with about 3-4" of accumulation. We're on the downward swing of winter now with hopefully only 4 or 5 weeks to go. Then Spring! And what does Spring bring? Easter! 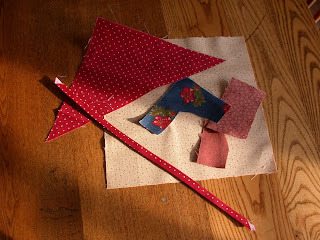 I have lots bits and pieces and half square triangles left over after making the sashing for my Primitive Garden BOM quilt and got to thinking about what I could do with them. 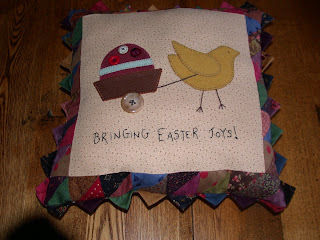 Since many of the half square triangles were already sewn together, I decided to make an Easter-themed pillow. There is a cute pattern in the latest issue of Create & Decorate with a little chick pulling a wagon with an Easter egg and after a few tweaks and changes, here's the end result. All the elements are made of wool and I used buttons for the decorations on the egg and a large one for the wheel. I added prairie points to try to use up some of the smaller pieces of fabric. It was fun to do and worked up really quickly. I remember reading somewhere that stacked quilts should be refolded frequently to prevent fading along the folds and I did that as well. 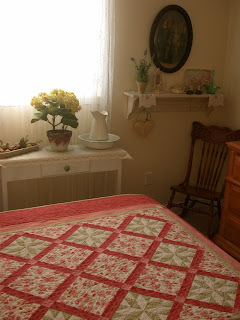 It took a while as I have quite a few and used the opportunity to change the quilts on the beds. 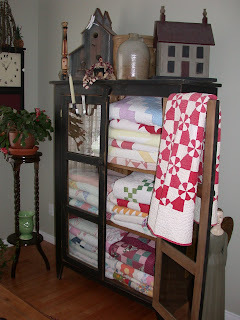 Our friend Graham made the quilt cupboard that houses my antique quilt collection in our living room. I have a few ideas of what I'd like to work on today, so we'll see how that goes and what I can get done. Happy stitching! Today was auction Saturday in our little town. I love auctions, not only for the treasures that might accompany me home but it's always a great place to meet with friends and acquaintances who share a common bond. But, I did manage to pick up a treasure. A stitched sampler dated 1939 that's already found a home in the spare bedroom. From what we could determine, this is not a biblical verse. 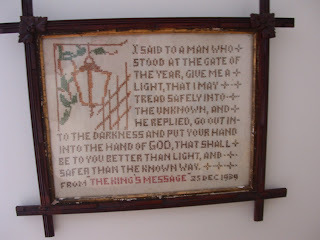 Because of the date...December 25, 1939...and the fact that it says, "from the King's message", my husband and I think that this is a part of a message that King George VI gave to the British troops who were going off to battle in WWII. In any event it doesn't matter because I love samplers! I have always wanted to stitch a traditional sampler and that is still on my "to do" list. Perhaps this will tide me over til I can find the "perfect" one . Yesterday was another of those running around days doing errands where it seemed like all I was doing was looking for one parking space after another and getting in and out of the van. By the time I got home I was exhausted, so I plugged the in the kettle and made myself a cup of tea. Aaaaah...tea warms the body and strengthens the soul. I had hoped to get at the second, second block of the Tisket-A-Tasket BOM before now but I was busy working on my Easter swaps which are now completed. Now I can relax and do stuff for me again. My one to the states was mailed on Wednesday and the one to Australia will have to wait til our next trip stateside because the cost of mailing packages overseas from Canada is astronomical. New York state is only 40 miles from where we live. We're down there shopping at least once every two weeks and I think we're planning on going next weekend. I have already completed the February block in cotton doing the traditional needle turn applique method but I also am working on a second set in wool. So, after my cup of tea yeaterday afternoon, I cut out all the pieces, started stitching it last night and completed it this morning. The colors of the birds should have been reversed but by the time I realized what I had done it was too late...not enough of this blue wool in my stash to cut another one. I know better than to start a project when I'm tired but I'm still happy with the way it turned out. 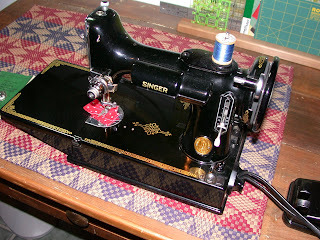 Lucy, from Quilting with the Past, asked me if I could post some closeup phots of my Featherweight machine. 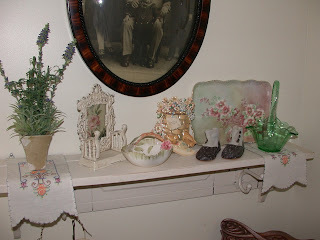 When you visit Lucy's blog, I think you will see that she is as much enamoured with old things as I am. As I mentioned previously, this was a surprise gift that my Dad gave to my Mom shortly after returning from WWII in 1945. What I didn't tell you was that my Mom was not a sewer and didn't use the machine all that often. I guess that's why it looks almost brand new and works like a charm. It brings me great joy whenever I sew with it and it purrs just like a kitten. It gets plenty of use now, mostly for uncomplicated piecing. I'm going to use it exclusively on a baby quilt for my nephew and his wife who are expecting their first child in May. I know that would make my Mom both proud and happy. There was a gal who owned a tole/decorative painting shop, had a very hectic travel teaching schedule and looming publication deadlines. But in her thoughts and dreams, there were always visions of quilts...colorful ones, with lots of pieces and made with love. 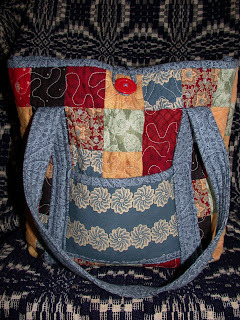 One day she saw an advertisement for a beginner quilting class and she decided to sign up. The class ran for eight weeks and taught several different blocks and techniques. Most of the cutting was done in class and there was lots of homework between lessons to complete the sewing of the blocks that were covered that particular week. Needless to say that because of her schedule and the fact that she had not used a sewing machine in over twenty years, the homework never got done. But faithfully she would return each week and diligently took notes. The eight weeks went by quickly. 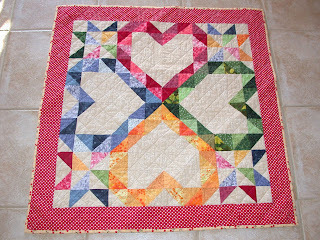 Most of the gals in the class had either finished piecing their quilt tops or were pretty close to it...except for one. However, the gal who had not completed one block promised both the teacher and the others in the class that the top WOULD eventually get done. As promised, six months later, the top was completed. The year was 1984 and the gal was me. 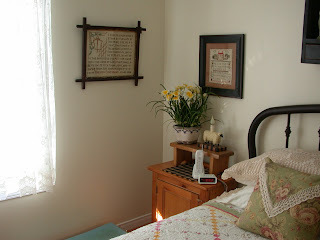 The completed quilt top was put away for 23 years...but was never forgotten. The quilt dream never left me. During my career, I had the opportunity to travel alot and managed to amass a collection of 20+ antique quilts. 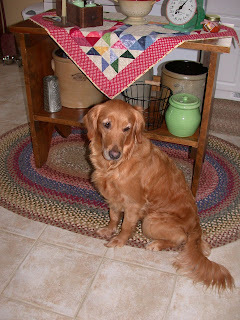 When I retired in 2007, I became friends with a gal in the small town where we now live who is a quilter. She asked me to show her the quilt top that I had made and it was she who talked me into finishing it. That was in August of 2007. 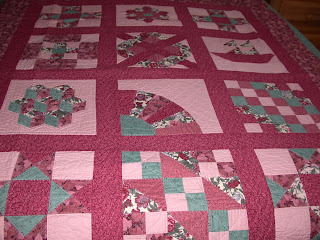 It took me about six weeks to complete the hand quilting and she showed me how to do the binding. My taste in colors has changed significantly since then and you can see how the fabrics date the quilt. But I'm happy that I did take the time to complete it. My only regret is not being able to show it to my teacher who has since passed on. I'm certain she thought back in 1984 that it would be just another student with another UFO. 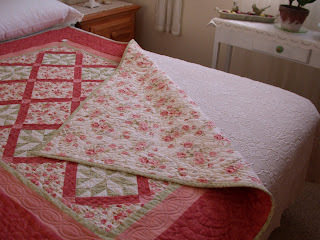 Now my quilt is 25 years old and I keep it in my quilt cupboard along side my other antique and vintage quilts. The label says, "Pieced in 1984 and completed in 2007". What was once a dream had finally become a reality. 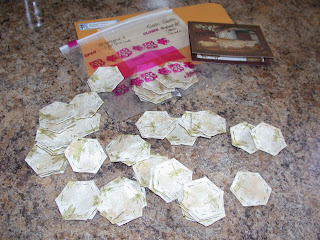 Finished my 50 (+ 1 for good luck) hexies yesterday for the Hexagons of Hope and they are all packaged and ready to be sent off to Australia tomorrow. I am diligently working on my Easter swaps. One is ready and will also be sent off tomorrow and the other is still being worked on. I can't post any pictures til I hear that my swap partners have received their packages because it would spoil the surprise but I'm pleased to say that I used everything from my stash on hand to make everything. Yippee! I've been on a roll this weekend, or so it seems. I also completed the first block of the Tisket-A-Tasket BOM in wool. I'll probably prepare the February block later today and work on it tonight. I enjoy working with wool on cotton and find it works up very quickly and is very forgiving. 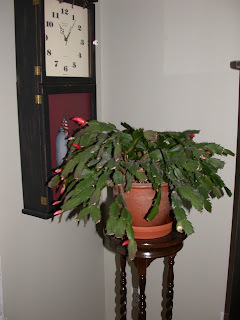 My Christmas cactus is coming into bloom again for the third time since November. This is the second year in a row that it's doing this and I just love the flowers that it produces. The buds start on the side first where it faces the light so I give it a slight rotation every second or third day and it's fun to watch the buds form and then open. 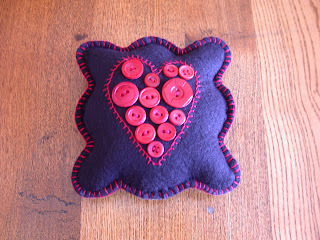 Here is a little pillow that my friend Lucie made and gave to me for Valentine's Day. 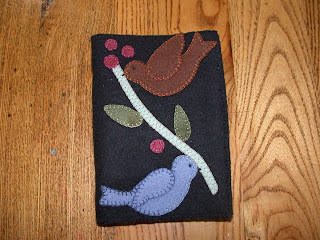 It measures about 4" x 4" and is made out of wool with different sizes of red buttons sewn on. It fits in with all my other little pillows that I keep as a gathering in my trencher. 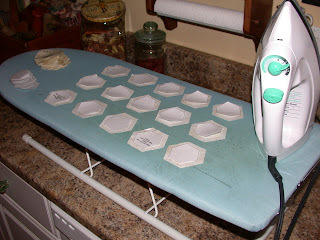 There's a fun group that is open to anyone who is doing any hexagon project...or who may be interested in doing one...to join this relatively new blog to share tips, show photos and for just fellowship in general. 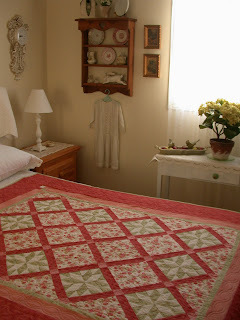 The blog was started by Robyn who lives in Australia and is called the Hexagon Quilt Along. Having said that, I'm sure you've all heard on your local newscasts, no matter which corner of the would you live in, about the devastation, loss of lives, homes, businesses, domestic animals and wildlife as a result of the bush fires in Victoria, Australia. 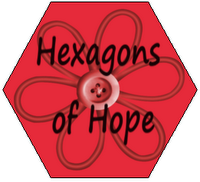 In recognition of the hardship that the burned out survivors are enduring, Robyn came up with the idea for The Hexagons of Hope. Briefly, she has asked for volunteers to make any amount of 2" hexagons to be donated to the women who have survived the devastation. We all know the peace that stitching gives each and every one of us and this is perhaps one small way that we can try to provide it for them. 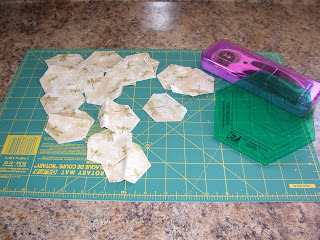 Even though you might never have made a hexagon before, Robyn has all the information on the new Hexagons of Hope blog, which includes a visual tutorial and a link to download the 2" template. Please find it in your hearts to take a little time out from your busy lives to help these families. I've committed to making 50 hexagons which I just cut out, but any amout will do. The freezer paper templates are ironed on and hopefully I'll finish the basting this weekend and have them in the mail on Monday. I know how busy our lives are and for me, this certainly brings back memories of when we were living in south Florida in 1993 when hurricane Andrew came on shore and the destruction that was left behind. Let's do what little we can to help. Please pass this information along to anyone who you think might be interested in participating. We left home at about 8:00 this morning and arrived home just after 3:00 happy, almost penniless and our tummies full from a delicious lunch. Our first stop was Homesense, a shop with a plethora of goodies from housewares, fine china, home furnishings, bedding, books, silk flowers and a host of other goodies too numerous to mention. The only thing I can compare it to in the states is a cross between Marshalls, Tuesday Morning and the Christmas Tree Shop. I wanted to see if they had any red glass to add to my collection that may have been marked down in the Valentine section, but to no avail. However, I did find some neat Easter stuff that I can't tell you about because most of it will be going to my swap partners. I'll take some photos to show after I know they have received their packages. I could have blown the bankroll in that store but I managed to contain myself. After putting our parcels in the van, the next stop was Michael's only two doors down. Low and behold, a piece of red glass that was marked down jumped out at me, which of course I had to buy. I also bought four skeins of #304 red embroidery floss for a redwork quilt that is on my "to do" list and a ball of ecru Perle cotton. I managed to find a few goodies for my Easter swaps there as well, but mum's the word. Next was Home Depot for the peg board and molding. That was in-and-out real quick because the next stop was...the QUILT shop. I bought more embroidery thread to add to my ever growing collection, some embroidery needles and what else? 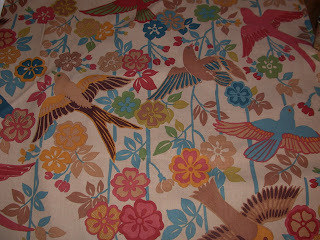 Fabric...10 fat quarters that called my name as soon as I stepped over the threshold! I couldn't leave them there, could I? After tearing ourselves away, it was almost noon and time for lunch. We went to a little tea room where they serve homemade soups, salads and sandwiches, so that's what we had...and a pot of hot tea served in a real china tea pot with real china cups...a great way to end a great day of shopping. This is mid February, right? And this is Canada, right? Then what the heck is this rain all about? We were supposed to have freezing rain on Tuesday and even the school buses were cancelled in anticipation of the bad weather but we dodged that bullet because somehow the wind came up and blew the storm off course. Yesterday the daytime temperature reached almost 40F and we opened the windows to let the fresh air in. It started raining late last evening and it's still raining but it's supposed to return to normal temperatures by tonight. The snow looks like it's sunk about 8" but there's still lots of it. 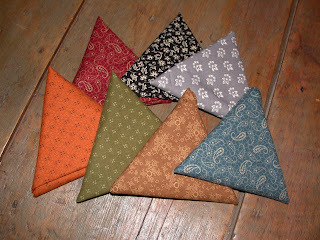 I finished sewing the half square triangle outer border on the Primitive Garden BOM this morning. The other day I spoke about getting a new lease on my creative life when I was inspired to rearrange, organize and clean my studio. Mel left me a comment about how she loves a clean studio and then doesn't like to mess it up after she's cleaned it. I was like that for a day or so and then I dove head first into those half square triangle thingees and you should have seen the mess. But, it's back to normal again as I cleaned up right after I had finished ironing the outside border strips and I think that's the solution...clean and tidy up right after you're finished and then it's done! Now I need something portable and easy to work on. There's always my Grandmother's Flower Garden work-in-progress but decided instead to do the Tisket-A-Tasket BOM in wool...for me. 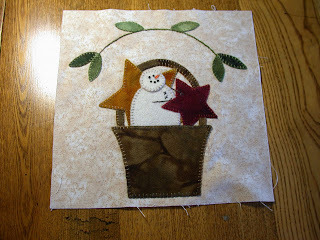 The one I'm appliqueing using the needle turn method is going to be my friend Lucie's Christmas present. The first block is ready and hopefully I'll start to stitch it this afternoon. Lucie and I are making the 65 mile trek to the BIG city tomorrow with stops planned for Home Depot for peg board and molding (see previous post), quilt shop for more embroidery thread and other "must haves", Michael's for embroidery floss for a redwork project that's in the offing and of course...lunch. 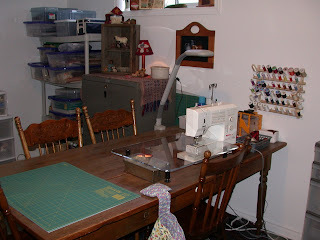 You all just have to look at how Karen from Sew Many Ways has organized her sewing room. Her creative use of pegboard has my imagination going wild. On our next trip to the BIG city, I'm going to buy some pegboard and molding and ask my DH to build a 3' x 2' framed piece of pegboard that I can hang on the wall where I sew. This would allow me to free up some space on my table and the things I use most often would still be within easy reach. 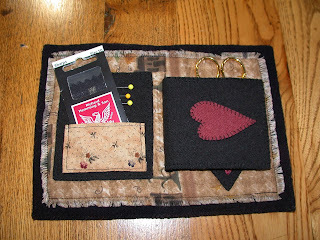 What a super idea Karen and thanks for posting it on your blog to share with all of us. Yesterday I spent part of the day cutting out about 250 - 2 1/2' squares to make the half square triangles for the outside border of my A Primitive Garden BOM quilt. 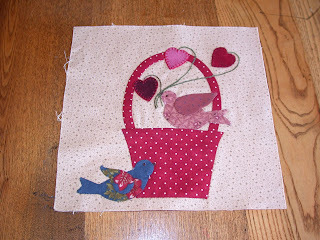 This has to be added before I can attach the first appliqued border block which I'm expecting to arrive any day. So far this morning, I've sewn the squares together and cut them in half on the diagonal. Now comes the part I really don't like...pressing them open. I find ironing with a dry iron much more difficult than using steam, but I've learned my lesson the hard way about ironing bias seams with steam. Let's see how much I can accomplish today. I'm anxious to complete the top as one of the gals from my guild who just started longarm quilting in the Fall offered to custom quilt it for me. I've seen some of her work and it's awesome...and she does everything freehand! 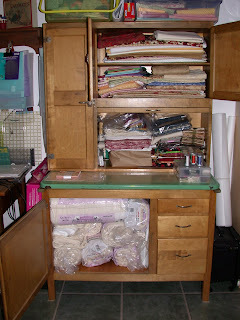 I've been down here in my sewing room since about 6:30 this morning... working at getting ORGANIZED! Since I started blogging about a week and a half ago, I've had the opportunity to "visit" so many of your creative areas which of course fueled my inspirational fire. 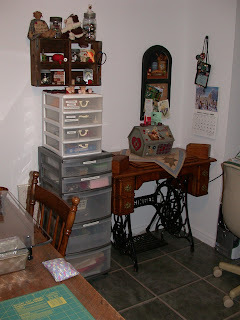 My prime source of inspiration came from Karen who had written about placing all her projects into their individual bins which, after seeing them on her blog, made so much sense to me that I had to do the same. Now, I have all my fabric that I've collected for each project placed into their own bins, complete with pattern and labeled on the outside. I shifted things around to make more room, dusted and vacuumed and now I'm set to go. I feel like I have a new lease on my creative life but I'm so tired from all my work, all stitching will have to wait til tomorrow. 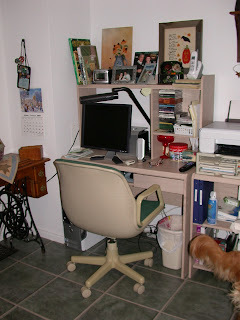 I'll start with my computer area and take you around the room in a clockwise direction. 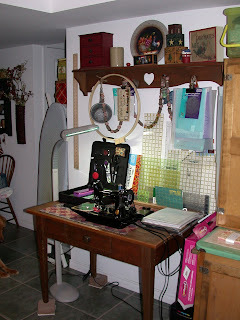 First, is my computer corner with the antique treadle Singer sewing machine that came with all the attachments and works like a charm. Next is the computer desk...oops, that's Lola's tail you can see on the bottom right. 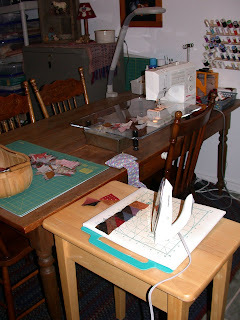 Then comes my Featherweight sewing area. This was the first "major" item that my Dad bought for my Mom when he came back from the war in 1945. It looks and works like the day he gave it to her. It's my pride and joy! 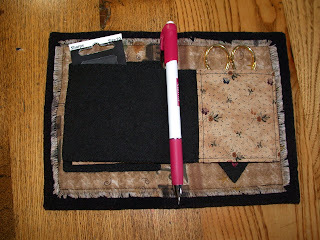 Next to this is my Hoosier where I keep my quilting books, some supplies and as much fabric as I can fit. The large cabinet below is where I keep my batting. Following this is the shelving unit with the labeled bins, my filing cabinet and then my sewing area. And last but not least are my Santas. 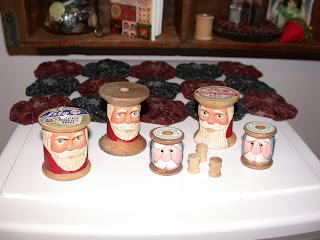 They were carved from antique wooden spools by a friend when we lived in Florida and I painted them. They're on display all year round because I just love them and they bring back fond memories. And that's my little corner of the world. Thanks for dropping by to visit. The kettle's always on so please stop in again. It's amazing how much one can accomplish when there are no interruptions, no meals to prepare, no one to clean up after or no one asking,"So what do you want to do today?" Now don't get me wrong, it's been nice to have been by myself with only the dogs since Friday night, but I do miss having my DH around. Having said that, I finished block number two of Tisket-a-Tasket BOM. I was surprised at how quickly it worked up. 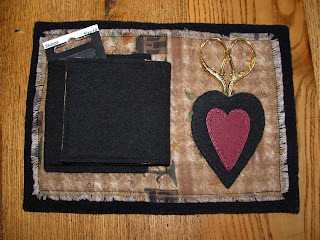 I made the hearts out of wool and blanket stitched them. Now I'm anxious for the third block to arrive. The sun was pouring in through the patio doors shining on my kitchen table when I took this photo so the colors appear to be much lighter than they actually are. It wasn't intentional that I reversed the colors of the birds. I guess that's what happens when you do things late at night and are tired. A couple of hours til DH is home so I guess I should start thinking about what to make for dinner. Happy stitching! We had a very busy day yesterday getting things ready for the weekend trip that my husband is attending with the youth group from our church. They left at around 6 last evening and are due back late tomorrow afternoon. After taking the dogs for a walk, I spent the night doing "girl-y" things like taking a long hot bubble bath while listening to "my" music, without interruption. Later, I made a hot pot of herbal tea and read til about 11 when my eyes reminded me that it was time to turn the lights out. I slept like a baby. This morning, after having a leisurely cup of coffee and some toast, I decided to start working on the second Tisket-A-Tasket BOM. I actually selected the fabric last night and this morning I traced and cut out the pattern pieces and am ready to begin the appliqueing. I decided that since I did the snowman in wool on the first block that I would carry on with wool somewhere in each of the remaining blocks. This month it'll be the hearts which I'll cut out when the rest of the elements are in place. I hope to get a good piece of this done today...famous last words, huh? A few of you asked if I could show more pictures of my Valentine decorating and I'd be pleased to since my DH thinks it's all junk (horrors!) and a waste of time. 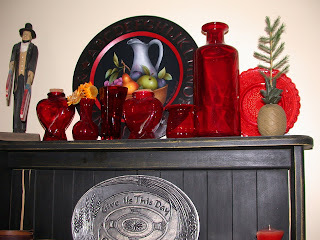 This photo shows my red glass collection, heart garland and a heart pillow in the trencher that I made from an old disintegrating (which broke my heart) red and white quilt purchased at an auction for $5. And a closer look. Can you see the heart-shaped bottles? The third bottle from the left is also heart-shaped but you can't tell from the photo. There's also a little red heart-shaped candle resting on a tin heart in the left corner which you can barely see. 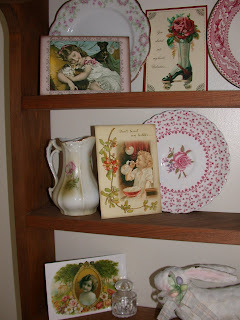 Next is a closeup of my vintage valentines. And more...are you getting bored yet? I enjoy changing the scenery now and again. Now I can't wait til Easter. Have a great stitching day! I love to decorate for the seasons and certain holidays. My favorite is Fall, then Christmas and then Easter. The only other "day" I decorate for is Valentine's Day but no where near to the extent of the others. Today I decided to take my Valentine stuff out. I have a few red glass heart ornies, different sizes of red glass bottles, a vintage heart shaped tin, a half dozen or so repro vintage Valentine postcards, a red berry garland with hearts and of course...a quilt! A gal from the guild that I belong to designed this table topper which I made last Spring and decided to use it as part of my Valentine Day tribute. 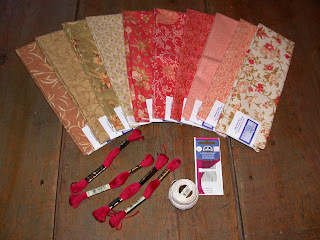 I used a variety of fat quarters and leftover scraps. This was my first attempt at mitered corners on the red polkadot border and I used a vintage cherry pattern fabric for both the binding and backing. It's not a large quilt measuring approximately 36" x 36" and I cross-hatched the quilting. 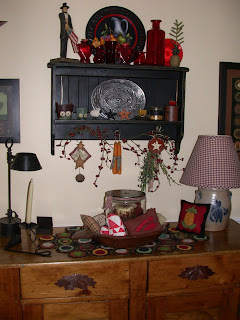 It's displayed on an antique pine shaker style table which we use as an island in the kitchen. And there's Lola, posing so beautifully in front. The bitter cold weather is back and perhaps I should be thankful because staying indoors has allowed me to complete another project. 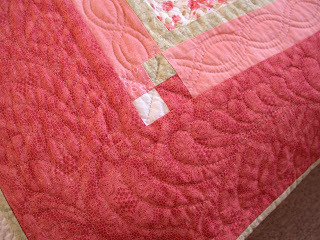 When I saw this quilt in a book loaned to me by a friend, I could just imagine it done with rose-themed fabrics. I love roses and love to paint them as well. 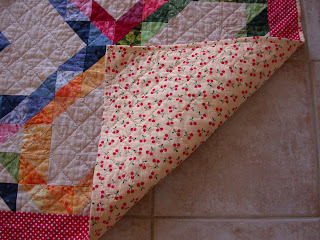 I found this quilt somewhat of a challenge because I had no idea what "en pointe" was, but I sure do now. 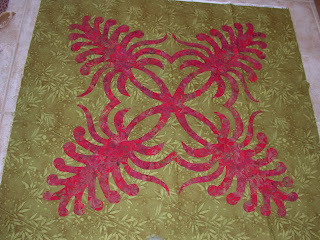 I opted to hand quilt this one and I just love the feather pattern which I hope you can see below on the outside border. I also like to use a coordinating fabric on the back. Here's a peek at what the reverse side looks like. And this is a photo from another angle. 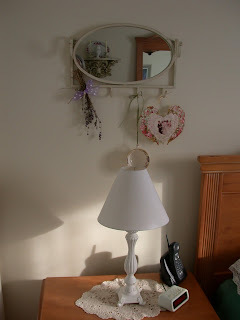 I'm pleased with the way it turned out and even my DH had some positive comments. Place the butter and brown sugar in a small saucepan and stir over medium heat til the butter has melted and the sugar has dissolved. Continue cooking for a few more minutes til the sugar starts to caramelize. Remove from heat and pour into a greased 9" cake pan. Sprinkle evenly with the fresh cranberries. In a large bowl, whisk together the flour, baking powder and salt. In a separate bowl, cream the butter and sugar til light and fluffy and then beat in the vanilla extract. Add the egg yolks one at a time beating well after each. Add the flour mixture alternately with the milk. In a clean bowl, whisk the egg whites with the cream of tartar just til the whites hold a firm peak. With a spatula, gently fold the beaten egg whites into the batter in two additions. Pour the batter into the cake pan and smooth the top. Bake in a preheated 350 degree oven for 25-35 minutes. Cool on a wire rack for about 15 minutes before inverting cake onto serving plate.